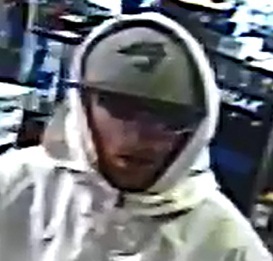 Cops Release Pics Of #Sackville Robbery Suspect | Sack-Vegas!!!! 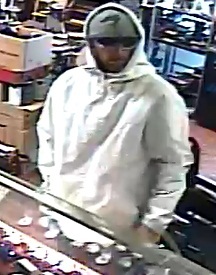 The RCMP/HRP Integrated General Investigation Section is seeking the public’s assistance in identifying the suspect of an armed robbery in Lower Sackville. On March 21st, at approximately 5:30 p.m., Sackville RCMP responded to a 911 call at a business (Cash Traders) on Sackville Drive. A male suspect entered the store, assaulted the employee, stole jewelry and then fled on foot. The 64-year-old male employee sustained minor injuries in the assault. The suspect is described as a 5’8′ tall white male with reddish facial hair in his mid 20s. He was wearing a Toronto Blue Jays baseball hat, white jacket, white hooded sweatshirt, jeans and black sneakers. Anyone with information about this incident is asked to contact Halifax RCMP, Halifax Regional Police or anonymous tips can be sent to Crime Stoppers by calling toll-free 1-800-222-TIPS (8477), submitting a secure web tip at http://www.crimestoppers.ns.ca, or texting a tip to ‘CRIMES’ (274637) TIP202 + Your Message. Posted by Sacky on March 29, 2014 in Shared News.